❤ This year we’re helping Santa and we’ve got some outstanding presents to giveaway to some of you lovely members in the lead up to Christmas! We’ll be giving away at least one prize a day from Monday December 10th to Friday December 21st and better yet – these fantastic gifts will be delivered in time for Christmas! One entry per person and the competition is open to Cyprus-residents only. You can enter the draw up until the last day but the sooner you enter, the better chances you have to win a prize! 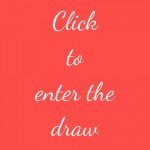 On entering the draw, you will be eligible to win any one of the 12 daily giveaways. There’s no chance to swap your prize…. if you win a prize that’s not right for you, we’re sure it will make the perfect gift for a loved one this Christmas! Anyway, we think these prizes are so fab that there’s no way you’ll be wanting to swap them! Jules dort, mamie tricot crafts beautifully designed gifts for minis and their mums – handmade and handknitted. You’ll recognise her stunning items from our 6th Mums2Be & Baby Day 2018. 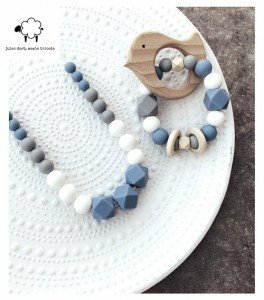 We are in love with this beautiful matching set that will be given away to one lucky winner – a teething necklace for Mum and animal teether for baby. She chose this gorgeous powder blue colour which goes perfectly with jeans for the Mummies. You will soon be able to buy Jules dort, mamie tricot online on our MiC Marketplace. You can also find her on Facebook and Instagram. 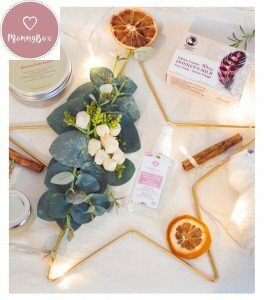 Mommybox Cyprus has brought a brand new concept to the Cypriot market – a gift box and soon to be subscription box filled with carefully curated natural and organic products for new and expecting mommies and their babies. Mommybox understands how important it is to care for your body during pregnancy and after giving birth. And it is equally important to use products that are as natural and organic as possible. 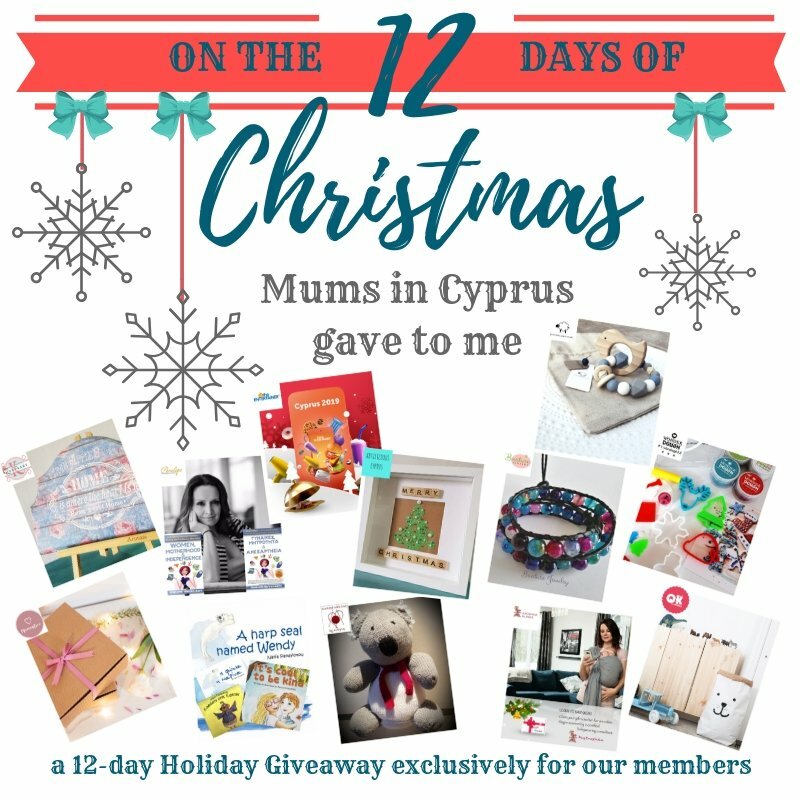 Their 1st Mommybox is dedicated to “Beauty made in Cyprus” and features products made by women entrepreneurs with materials sourced from our beloved island! Their Sweet MommyBox features products from the following brands: Hermann Gourmet Cosmetics, Gaia Olea, Regenas Gardens and MG Handmade Knits. MommyBox contents change bi-monthly to give you the opportunity to try new products from their collaborating brands. If you are not lucky enough to win this prize from MommyBox, you can always pre-order one for yourself through their website or Facebook page. Free delivery to your door is included. 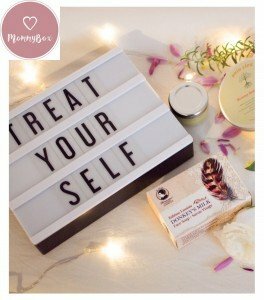 To spoil yourself or to pamper another supermum who is making/just made a baby, you can go to their website here; their Facebook here and their Instagram page here. Okiddoky is a Cyprus-based Baby and Kids online concept store where you can find all things beautiful and unique for your little ones, the nursery, the toddler room, your child’s activities, even for yourself and your home. Okiddoky were one of the MiC-curated local stores represented at our last annual Mums2Be & Baby Day. 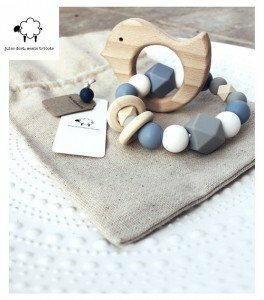 At Okiddoky you can find a wide range of beautiful baby and children’s products from prominent European brands focusing on design, organic quality and eco-friendliness. Okiddoky also stocks nifty and hip new brands that they find along the way. 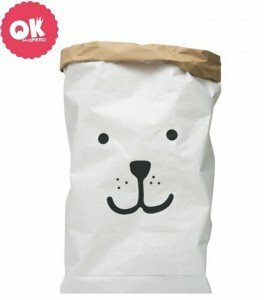 This gorgeous toy sack from TellKiddo – the Swedish kids interior brand – is made from recycled paper. It is durable, reusable and will make a playful design addition to any living area or kids room. You can go to Okiddoky’s online store here. You can also find them on Facebook and Instagram. Local author, Nayia Panayiotou, has given us three copies of her two humorous stories about finding yourself and overcoming your fears. 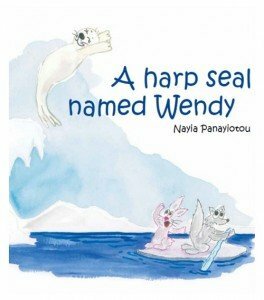 Erato the Turkey and Marina (or Wendy in English) the harp seal will keep you good company and remind you that you should be proud of who you really are, always believe in yourself and never give up. These stories are most suited for children aged 4-7. These books received funding from the Youth Board of Cyprus and they are both included in the published list of the Ministry of Education and Culture for the Student and Teacher library. They were also nominated for an award in the National Literature Competition for 2012 and 2013 publications, in the category ‘Literature for Young Children’. 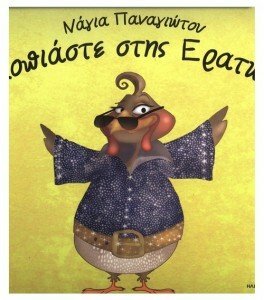 You can buy these books online on our MiC Marketplace and you can find Nayia’s Facebook page here. 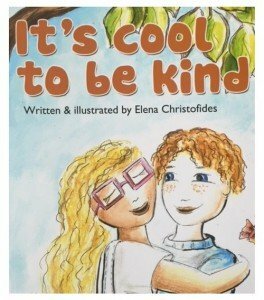 Local author Elena Christofides has given us two copies of her children’s book “It’s Cool to be Kind”, lovingly created to give positive messages. 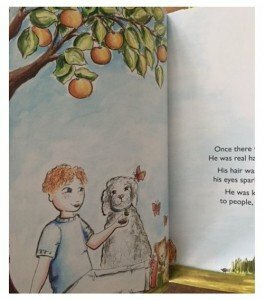 The story conveys the importance of being kind, accepting differences in others, having compassion, listening to one’s heart and practising mindfulness and yoga. Check out Elena’s Facebook page that has more information about the book; future book readings and selling points. Local startup Wonderdough has given us this fantastic Christmas playset to gift to one lucky winner. 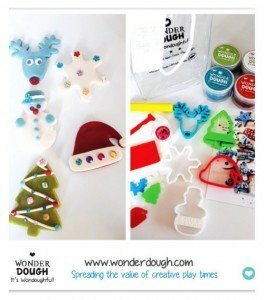 Wonderdough is an all natural quality product made with a sprinkle of love and kindness and was born after realizing the abundant benefits playdough provides to curious little fingers and beautiful imaginations. It gives kids the gift of creativity; spreads the significant creative play experiences children can gain through a medium as simple as playdough. 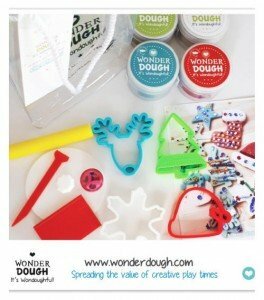 Wonderdough enhances well-being, reduces stress and anxiety, all the while encouraging creative and healthy play! You can buy Wonderdough online through their website here. They are constantly updating their product range throughout the year with fantastic themed cutter sets and seasonal products. They also make custom personalised sets for birthdays and christening favours. You can email them here to find out more. Find them on Facebook and Instagram where they share their amazing playdough-creative-play-idea videos. 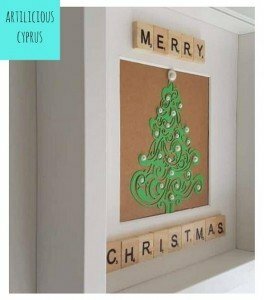 Artilicious Cyprus is a new local business making beautiful and unique handmade personalised frames. 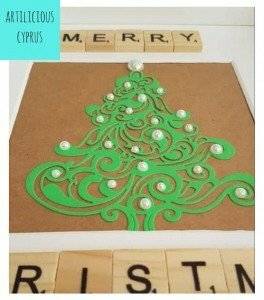 Artilicious Cyprus creates keepsake box frame creations to order in a range of themes and styles. Amongst our personal favourites of all her designs are her Lego superhero frames with personalised Scrabble tile names. Alex sends you pictures of your frame design before finalising it so you can approve it, ensuring that you get exactly what you envisaged. She sends them carefully wrapped and packaged across Cyprus and worldwide – perfect family & friend seasonal and celebratory gifts. Check out her Facebook and Instagram pages for more details on the various sized frames you order; prices and available designs. You can order your own custom box frame via messenger on either page or via email here. Penelope Magoulianiti, who you will probably recognise from her #DreamDareDo blog series with Mums in Cyprus, has written this book to help all Women who wish to continue living their dreams, achieving their goals and becoming successful without having to compromise their dreams and desires because of Motherhood. In this book you will find strategies and ideas that you can apply to your life daily in order to stay on top of things, become more creative, more energetic, and healthier irrespective of how much sleep you have managed the night before. We’ve got two copies to give away to you lovely mummies. The book will encourage and guide you to step out of your comfort zone and claim what is rightfully yours… your success, your financial freedom, your confidence, and beauty. Women, Motherhood and Independence will help you reclaim your life and assist you in finding your own success path post childbirth. Whether you are already in a career, you have your business, you would like to start a new business, or you just want to be more present and engage more in family life and activities, Women, Motherhood and Independence will help you utilise your talents, become more focused and achieve more in less time with less stress. The best things in life are…Buy One Get One Free. 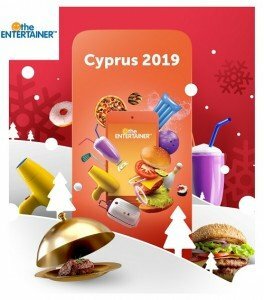 We’ve been big fans of The Entertainer App for a long time and this year for Christmas, The Entertainer Cyprus has given us a VIP key for one lucky winner to download their fab lifestyle App so you can enjoy hundreds of 2-for-1 and discount offers across Cyprus throughout 2019! You could be eating an amazing meal, going to a spa, having drinks with friends or even visiting a waterpark. With this amazing App, you can do even more of that AND save money! Read our recent blog post here that explains all about The Entertainer and why we think it is a must-have App in Cyprus! 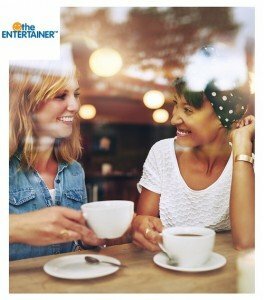 The ENTERTAINER is your everyday lifestyle savings App with over 1,200 buy one get one free and discount offers in Cyprus. With fantastic offers in multiple categories from dining, beauty & fitness to attractions, you’ll save money on the things you love to do. As an extra HUGE bonus, the prize also includes 3 additional free apps for England, Scotland & Wales with a retail value of £102 and over 3,700 outlets offering 2 for 1 and discount offers. See the full list of UK offers here, which includes Jamie’s Italian, Busaba, Meat Co., White Brasserie, Banana Tree in the Food & Drink section plus Legoland, Madame Tussauds and Alton Towers just to name a few! It’s a must have app for anyone who is planning a trip to the UK in 2019! Check out the amazing range of offers available with The Entertainer Cyprus app on their website here. You can also find them on Facebook and Instagram. You will probably recognise the name Kroshka Slings from our 6th Mums2be & Baby Day 2018 where Veronica demonstrated to our visitors different sling carrying methods and presented her beautiful handmade naturally-dyed sling collection and handcrafted teethers – both of which are available to buy on our MiC Marketplace here. There are so many types of slings and carriers available that it can be really difficult to decide on which one to buy – which one is best for your family and which one is safe. With a lot of knowledge, care and baby carriers to try (she has even established a sling library! ), Kroshka Slings can help you find the best one for you and your baby. Through providing one-to-one baby wearing consultations, focusing on safe baby wearing techniques, optimal positioning and all the different options that are available to you, Veronica can help you make this decision. Even better, once you decide on your baby carrier she will always support you on your baby wearing journey by keeping in touch and providing you with baby wearing solutions and ideas… Kroshka Slings will help you and your baby build a bond for life! Find My Kroshka online here and on Facebook here. Bnature Jewelry was established in 2017 in Cyprus out of many years of passion to create handmade jewellery pieces. Bunmi works from home, which gives her the opportunity to be around to support the activities of her daughter and participate in charitable work. In her designs she likes to use different materials but you will find more of her creations made with semi-precious gemstones. She also takes customised and bespoke orders. A lot of love and passion goes into every piece she creates and she derives joy from the process of making something beautiful and the feeling of satisfaction she gets when it goes to its new owner. Bunmi’s wish is that you will enjoy having a piece of her creation as much as she enjoyed making them. 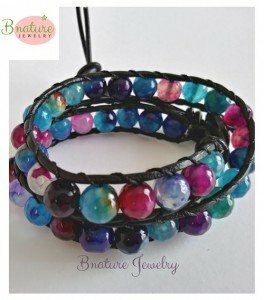 You can buy Bnature Jewelry’s creations online on our MiC Marketplace here. Find her on Facebook and Instagram here. 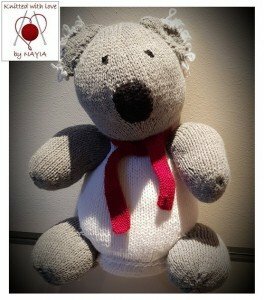 Knitted with Love by Nayia has given us one of her cutest handmade creations, Olie the Koala bear, to be won by one lucky mini-MiC-er to this Christmas! Olie is looking forward to finding his forever home – to keep a mini warm this winter and be given lots of cuddles! Find Nayia’s creations on Facebook here or catch her at a local market in the near future! 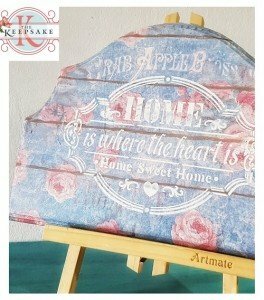 The Keepsake is a new startup in Limassol handcrafting small handmade items and home décor and upcycling individual and unique furniture pieces. They put time, love and attention to detail in all their items while trying to keep their prices reasonable, all the while maintaining consistently high quality. They carefully curate one of a kind items of furniture, and can also create bespoke pieces for you – giving a new lease of life to your already-owned items. They are centrally located in Limassol and are now open every day apart from Wednesdays and Sundays. 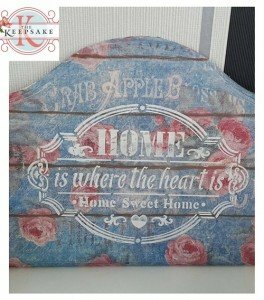 The Keepsake has given us this beautiful shabby-chic plaque, complete with stand, for your home. Take a look at their current range in stock on their Facebook page or pop in to their shop. 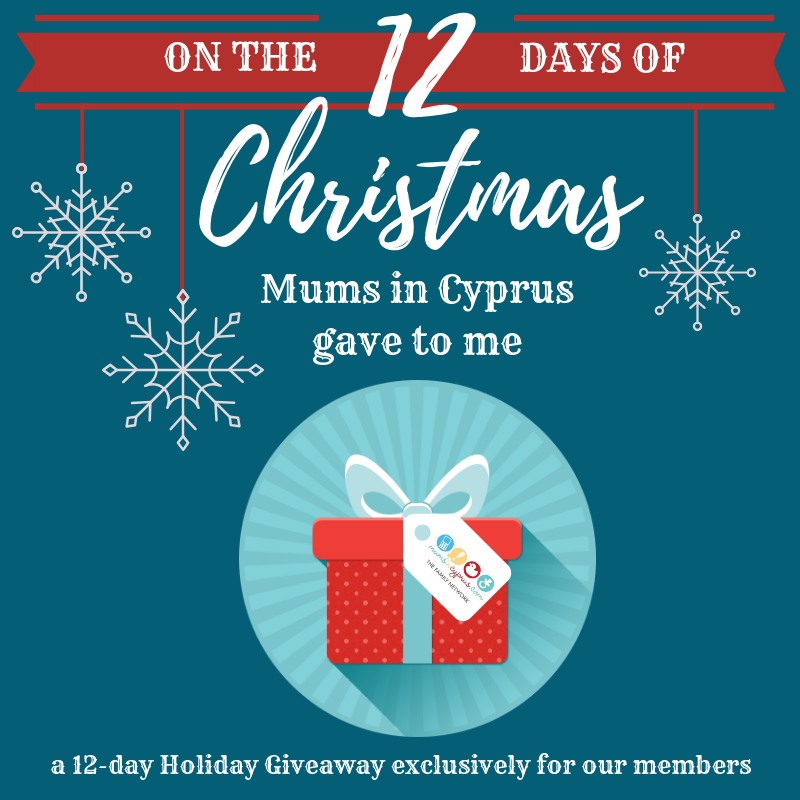 Our Giveaway is open to Cyprus residents only. One entry per e-mail address and per person, which makes you eligible to win any one of the 12 daily giveaways. You can enter the draw right up until the last day – December 21st! Enter as soon as possible to increase your chances of winning. Minimum of one winner every day from December 10 through to December 21, 2018.
and your prize will be delivered to your nearest AKIS Express. #WednesdayWin – Free tickets to Masterland!